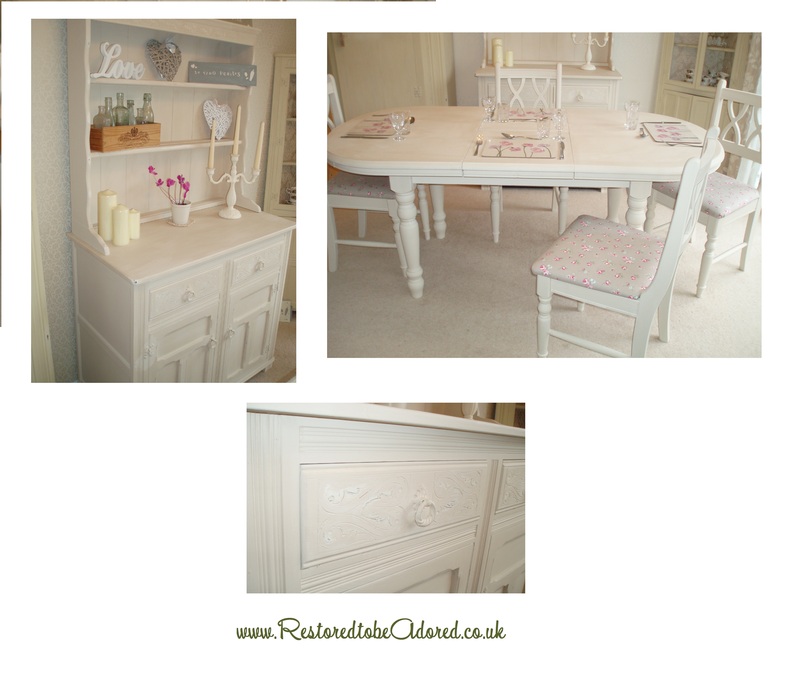 A stunning hand painted Country Chic Style Kitchen/Diner set ~ Table, 4 Chairs and Oak Dresser. This set has been painted in the fantastic `Cocos ` ~ Autentico; pure and natural paint. This is a classic creamy cappuccino tone and would go with most colour schemes. The chair seat pads have been reupholstered in the delightful Clarke and Clarke Rosebud fabric which compliments the paint beautifully and adds to the cottage chic charm. The seats have been treated with Dunelm fabric protector http://www.dunelm-mill.com/shop/fabric-protector-spray-110937 . The table has been protected with Autentico Sealant, however painted table tops should still be handled with care and coasters! The chairs have been waxed to set and protect the paint. The table has a centre extension so could comfortable seat 6. The Dresser having been painted inside and out has then been distressed for that Shabby Chic finish. With two draws and a shelf in the cupboard this dresser provides fantastic storage capabilities without taking up too much space. The draws have been lined with Laura Ashley paper. As with all Restored to be Adored pieces this is not new or mass produced, it is a customised one off item that has been painted with care but without making it look new or perfect, as this would lose the character of the piece! It is a charming country cottage styled piece. These pieces can be bought as a matching set or as individual items. You can buy with confidence I have received 100% positive feedback. I use the eco-friendly ~ Autentico; pure and natural paints, waxes and sealants. These paints provide a fantastic lightly textured and matt finish which is perfect for the shabby chic look. You will be able to see light brush marks where it has been hand painted adding to the character of my pieces. Only good quality products, please visit my suppliers website for full details; www.autentico.co.uk, www.dunelm-mill.com. Delivery can be arranged within 25 mile radius of Maidstone, Kent please contact me for a quote. Unfortunately I can’t provide a personal delivery service outside this radius but please do contact me to arrange a collection or discuss courier options.